Dnn > Hot Topics > Could this be NYC in 2140? Could this be NYC in 2140? 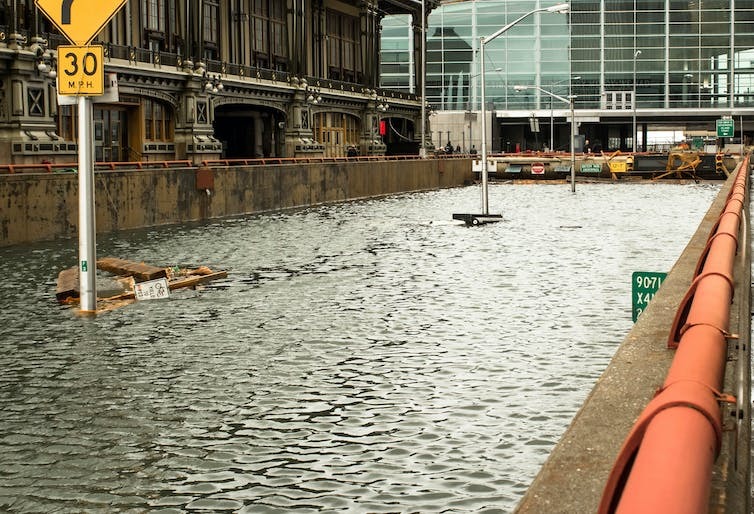 Climate fiction: A novel describes New Yorkers keeping on even after 50 feet of sea-level rise next century. Earth’s climate system is replete with potential surprises, and the climate science community tends to be conservative when projecting future changes. The world also suffers from a creative deficit in imagining the human response to climate change – a deficit that fiction is well-suited to help alleviate. One focus of my research is on sea-level change, both in the past and in the future. In his new work of climate fiction, “New York 2140,” author Kim Stanley Robinson supposes that climate scientists like me will be surprised by how quickly the world’s ice sheets will shrink and sea levels will rise. His novel explores how civilization might nonetheless muddle through to remake this reshaped world. In Robinson’s future, the First Pulse of Antarctic and Greenland ice sheet collapse in the 2050s led to 10 feet of global sea-level rise in the course of a decade. The First Pulse and the food crisis of the 2070s served as focusing events, leading the world to take greenhouse gas reductions more seriously. Electricity generation shifted to renewables; container ships were replaced with fleets of wind-powered clippers; lighter-than-air airships replaced airplanes. Yet these efforts were not enough to avoid a Second Pulse at the end of the 21st century, driven first by melting at the Aurora Basin in East Antarctica but then cascading around the world’s ice sheets, leading to a further 40 feet of sea-level rise. Current science suggests the speed of sea-level rise in Robinson’s future is implausible. The United Nations’ Intergovernmental Panel on Climate Change (IPCC)’s 2013 report estimated that, under a future with high greenhouse gas emissions, global average sea level would likely rise by between about 1.5 and three feet over the course of this century. My research group’s projections generally agree with the IPCC’s assessment. But the IPCC assessed only what is “likely”; our group’s work also suggests that sea-level rise as high as about eight feet by 2100 and 18 feet by 2150 is physically plausible, though extremely unlikely. To understand how much sea levels will rise in the decades ahead, scientists study the mechanics of the land, ice, air and water in Greenland and Antarctica. But there’s a lot we don’t know about the behavior of ice sheets, particularly those – like the West Antarctic and parts of the East Antarctic including the Aurora Basin – that sit on ground that is below sea level. For example, warm water can attack submarine ice from beneath. If the ground underneath the ice sheet is sloping the wrong way, deepening toward the continent’s interior, the water’s advance will set up a self-sustaining cycle that exposes a growing cross-section of ice to erosion. 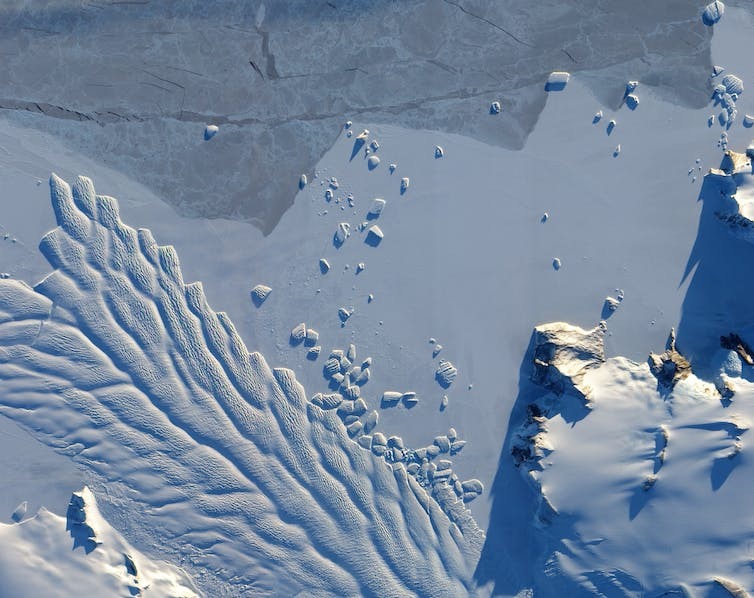 In addition, ice sheets can form unstable ice cliffs at their margins. A recent study that incorporated the collapse of ice cliffs found that, under a future of high emissions, it may be significantly easier to get to eight feet by 2100 and 18 feet by 2150 than previously thought. Still, even that study could not produce Robinson’s 50 feet until after 2200. Robinson’s novel, however, is not a scientific projection: It is an exploration of human resilience in the face of extreme pressure. There are four basic ways coastal communities can respond to sea-level rise: suffering damage, developing protective infrastructure, finding ways of accommodating flooding and retreating from the coast. Robinson’s New Yorkers engage in all four – and Robinson’s vision of accommodation is profoundly richer than in the imaginings of adaptation strategies developed by national, state and local governments. Despite the environmental apocalypse, life carries on in a flooded New York that has remade itself as a super-Venice. (See Climate Central’s Surging Seas maps to explore what Manhattan would look like with 10 meters (33 feet) or 20 meters (66 feet) of sea-level rise.) The submerged streets of Lower Manhattan have turned into canals, crisscrossed by pedestrian high lines. Vaporettos have replaced taxis. Skyscrapers whose bases have fallen beneath the waves are protected by nanodiamond coatings and powered by solar microgrids. Hurricane Sandy as precursor? In the climate fiction novel ‘New York 2140’ New Yorkers adapt to sea-level rise by converting streets into canals. Retreat has occurred mainly from the intertidal zone of Midtown Manhattan, where the forces of the daily tidal cycle wreak havoc on structural integrity. On the dry land surrounding the Cloisters, far uptown, carbon nanomaterials originally intended for space elevators allow new buildings on the shrunken island to reach hundreds of stories upward. Technological progress focused on improving lives rather than accommodating the changed world has apparently slowed to a crawl – in some ways, not much has changed from today. Airships are steered by chatty but rule-bound AIs, and communications take place by tablet, with celebrities broadcasting live feeds of real-world adventures through the cloud. Though this slow pace of progress may be literary license taken to make the world more relatable, it may also be a fair projection: If environmental crises consume the world’s R&D budget, there may be little left for innovations without a survival benefit. Meanwhile, financial capitalism proceeds much as it did in the early 21st century, periodically growing and imploding bubbles and receiving government bailouts. As in most of Robinson’s works, the limits of the capitalist system serve as a motif: The book culminates in a democratic-socialist fantasy of an alternative political response to a bursting financial bubble that seems more rooted in 2008 than 2140. In the real world, when climate change first entered the mainstream of civic discourse in the late 1980s, policy discussion focused almost entirely on limiting greenhouse gas emissions. While the world has made some progress, reflected in the United Nations’ Paris Agreement and in the recent near-stability of global carbon dioxide emissions, the pace has been slow. The planet is increasingly feeling the effects of climate change, and so adapting to these effects has become a growing part of both scientific research and public discourse. But most work on climate change adaptation has focused on near-term, marginal changes: for instance, making communities more resilient in the face of ever more common weather extremes, or installing pumps and elevating infrastructure to deal with the rapid growth of minor “nuisance” flooding along the shore. Climate change and sea-level projections usually end by 2100, and on that timescale, two to three feet of global sea-level rise is far more likely than Robinson’s 50 feet. But the world will not end in 2100, and many of the public works built today will still be around a century from now. In New Jersey, for example, many of the electric grid’s switching stations that flooded in 2012 during Superstorm Sandy were sited more than a century earlier, during the age of Thomas Alva Edison. So climate fiction can play a critical role in the face of the large-scale experiment we humans are conducting with the world’s climate system: inspiring creative rethinks of the designs and technologies needed to reshape how we relate to our environment. Science tells us that, by reshaping our global energy and agricultural systems, we can avoid the magnitude of planetary change that Robinson depicts. But to make those changes and to adapt to the changes we don’t avoid, the world’s best minds need to focus, not on new apps or financial innovations, but on the civilizational challenges at hand. Works like Robinson’s – starkly beautiful and fundamentally optimistic visions of technological and social change in the face of some of the worst devastation we might bring upon ourselves – can inspire that focus in a way that myopic discussions of the near term or grim, apocalyptic tales cannot.